I started out looking around at several other renditions of Jesus in my home and on the internet, that other artists have created, just to help me fix in my mind’s eye “this is what Jesus looks like.” Then I took a sheet of graph paper, since this was just going to be for my kids and only to transfer it to cloth later, and did a quick little sketch; however, I quickly regretted my choice of papers since the sketch turned out so well. Thankfully using my scanner and Paint.net made it pretty easy to remove the blue grid from the sketch. Making a really clean “coloring book” version of this sketch for the book, while still keeping the kind, but lively expression, was a bit problematic. It took some trial and error to figure out which lines could be removed or altered and which had to stay. I spent days making printouts, changing things, re-scanning, touching up on the computer and printing it out again before I had this final draft. Transferring the drawing to the fabric was accomplished with a permanent ink marker and a cut up printout of the picture that I traced like a puzzle onto the book page. (Yes I know it would have been less hassle to buy a transfer, but I was trying not to spend money). The sketch turned out so well I printed out extra copies to send as Christmas cards and as presents for a select few people. And reaching for the day. I know I must begin. This is actually a rewrite of a poem I wrote back in high school. I haven’t written a new poem in many years, but I used to really enjoy it. I am hoping that if I spend enough time editing the best out of my old ones that writing poetry will come back to me. 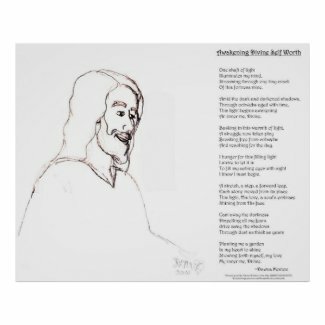 I also have this poem in conjunction with some of my forest photography, but I like it best with my sketch of Jesus. Vernonia Lake is full of light and beauty. 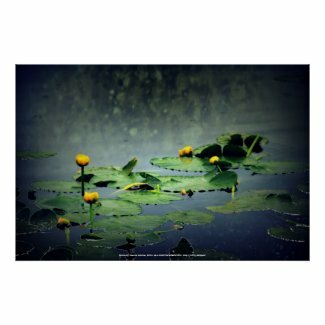 An Oregon rain splashes down–dancing on lily pads, yellow lily flowers and blue lake water in a synergy of energy, tranquility, and reflection. Last spring my son and I made a short stop at Vernonia lake. I had just gotten a zoom lens extender from my father-in-law, so while my son fished I tried it out on a great blue heron that was way out in the middle of the lake. It was a little tricky though since the extender does not have an auto focus or stabilizer and I did not have a tripod at that point–so the majority of the photos did not turn out well. One of the photos from that day that did turn out is the photo, taken without the extender, that I used in “Lily Pads In The Rain At Vernonia Lake” which was taken after it started to rain just before we left. I made it into a digital work of art by making the colors more vibrant, adding blue to the water and a textured layer of larger than life water splashes in the background. n addition, there is another layer of texture to add the effect of more rain droplets on the water and a neon layer to heighten the effect of water on the edges of the lily pads and the flowers.